You will have better chance of success if your dog is a puppy. A puppy who grows up with a cat is likely to see the cat as part of the pack. Your dog has an aggressive or predatory nature. An aggressive dog can seriously injure or kill a cat. Your cat is a small kitten, or is declawed, handicapped, or elderly. A kitten can be injured by an overly playful dog. Declawed, older, or handicapped cats are less equipped to defend themselves. Get to know your dog and cat well. Be able to interpret their body language and sense their moods. Your dog should be well-trained, and respond to commands to come, stay, and sit. You should also know how to blend mild discipline and positive redirection to gently influence your cat's behavior. Do not proceed with the introduction until you have completed the steps in this section. Beforehand, exercise your dog and feed him a nice meal; put him in a relaxed mood. Put your dog on a short leash or in his crate. Put your cat in her carrier if she's a scaredy-cat by nature; otherwise let her walk around. Be armed with lots of treats for good behavior. Let dog and cat check each other out at a distance. Pet and talk to your dog soothingly. It's not time for dog to approach cat just yet. Give your dog and cat some treats and praise as rewards. If your dog bolts toward your cat, correct him with the leash. If he shows any signs of excessive excitability, calm him. If this doesn't do the trick, cut the visit short and try again later. Repeat these short visits several times a day, gradually giving your dog more leash as appropriate. Do not move to the next phase until you have several consecutive days of incident-free visits in which both animals demonstrate to your satisfaction that they are comfortable with each other. Once your dog and cat consistently get along during leashed visits, you're ready for the next step. Take your dog off the leash, and supervise the two closely. If you see problems, and they don't abate with a few simple voice commands, back up to the previous phase for a few days. Gradually make the no-leash sessions longer. Do not leave the cat and dog alone until you're sure they're both fully comfortable with each other and there will be no trouble. Make sure your cat has places she can jump to for safety. Make some private space in your home for each animal. Use cat doors or baby gates if practical, as well as gentle discipline and rewards to enforce the rules. Keep kitty's litter box and food bowl out of your dog's reach. Now relax and give these guys some hugs. Sometimes, despite your best efforts, it wasn't meant to be. Some dogs are simply too dangerous to be around cats (occasionally the reverse is true). If your gut is telling you that this isn't working out, respect that message. The humane thing to do in this case is contact the shelter or breeder so that you can find a good cat-free home for the dog. In the interim, keep dog and cat separated and give them both lots of love. 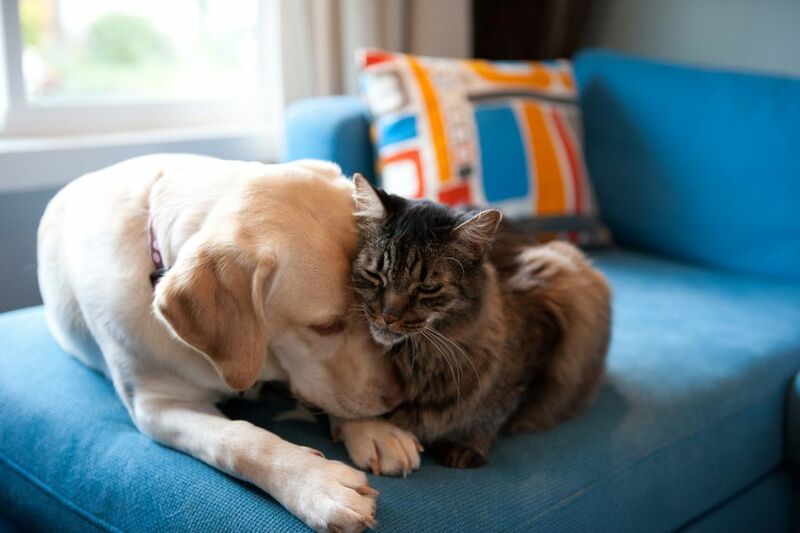 Dogs and cats can usually live together peacefully, although creating a harmonious "blended family" requires some planning, patience, and careful guidance on your part. In some cases your dog and cat will become best friends. Some dogs unfortunately will be too dangerous for your cat, and one of the most important points of this article is that you need to recognize when this is the case. This article specifically is about introducing a new dog to a resident cat; a separate (though similar) article will talk about introducing a new cat to a family dog. This is the HTML version of one of our former Shelter Sheets, which were designed to be downloaded and printed for handout by Humane Societies, Animal Shelters, Rescue Groups, and others involved in re-homing cats.